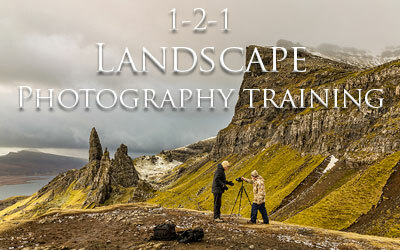 1-2-1 Landscape Photography tuition for those who prefer personalised photography training. This is a unique opportunity to be taught on a 1-2-1 basis with me. I will offer you expert advice and show you how to get the best out of any location. I will demonstrate how to create stunning images. I am happy to work with you on a *location that suits you too. The great thing about one-to-one training is I can gear the tuition for you, experienced photographer or a complete beginner, it really doesn't matter. Remember this training day is all about you!